The Rome meeting between House of Representatives (HoR) president Ageela Saleh and State Council president Abdulrahman Sewehli has drawn praise from UNSMIL chief Martin Kobler. He said he was encouraged by the encounter between the two men in the Italian capital. He Tweeted that it was a good step upon which to build and advance the implementation of the Libyan Political Agreement (LPA). The meeting was hosted by Italian foreign minister Angelino Alfano and attended by Italy’s ambassador to Libya Giuseppe Perrone. 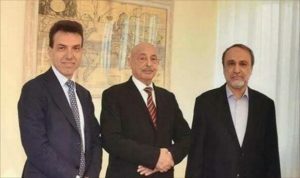 It is reported that the Tunisians also had a role in bringing the two Libyan politicians together. On Wednesday Kobler is expected to be in Algiers for talks with Abdelkader Messahel, Algeria’s minister for Maghreb, Arab and African affairs who has just completed a whirlwind trip to Libya during which he met Presidency Council (PC) head Faiez Serraj as well as Sewehli and also visited Zintan and Misrata. Messahel has said nothing about his discussions in Libya but it seems clear that he was looking to see find common ground on amendments to the LPA. The Saleh/Sewehli talks also drew support from Saleh’s HoR deputy Emhemed Shouaib who commended the courage of both parties and their patriotism in being prepared to work together to save the country from division. No one has mentioned that Saleh is currently subject to UN sanctions which include a travel ban.